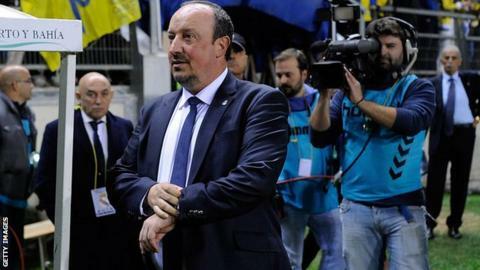 Real Madrid manager Rafa Benitez believes there is a "campaign" against him and the the club. A number of polls in Spanish media have indicated fans would like to see Benitez, 55, replaced at the Bernabeu. His side go into Wednesday's meeting with Real Sociedad third in La Liga, two points behind leaders Barcelona who have a game in hand on their rivals. "Everything that is open to criticism is criticised and that which is not is manipulated," Benitez told reporters. "What is clear is that there is a campaign against Florentino Perez, against Real Madrid and against the manager. "Surveys are carried out continuously and the media's interest in doing them is part of their interest in manipulating things". Spanish publications AS and Marca conducted polls in which Zinedine Zidane - currently coach of Real Madrid's second string - was the clear first choice to manage Los Blancos. Former Liverpool manager Benitez - who also coached in Real's youth setup from 1986 and managed the club's second team for two years from 1993 - was not an overwhelmingly popular choice as manager among the club's supporters when appointed in June. A 4-0 defeat at home against Barcelona in November saw Benitez widely criticised and a 10-2 triumph over Rayo Vallecano last time out has done little to ease rumours of discontent at the club. "Each week 13 players are left out of the starting eleven and it appears that these are personal decisions and there is speculation," added the former Chelsea and Inter Milan boss. "It has been like that from the start and there is clear manipulation of information. I can guarantee the relationship with the squad is infinitely better than what is seen on television." Real will go top if they overcome Eusebio Sacristan's side, but Barca and second-placed Atletico Madrid each play later on Wednesday and could seize top spot in La Liga, which is not yet at its halfway stage.